Answer: Getting your “affairs in order,” may seem like something only older people need to do, but in fact, there are a few key documents all adults should have, regardless of their age. These documents are important for your future and the future of your family. It’s best to have them prepared before you think you’ll need them. This document outlines how, and to whom, your assets will be distributed when you die. While drafting a will is typical during end-of-life-planning, anyone who wants to protect his or her assets should consider having a will created before then. Usually, people work with an attorney to create a will, so there should be at least two notarized copies — one to be kept with your attorney, and the other to be kept at home with your other documents. These documents are similar — in some cases, you may need both but they’re often used interchangeably, depending on your needs. A living trust and durable power of attorney both designate who you would like to make your legal and financial decisions if you’re ever incapacitated and unable to do so yourself. Some durable power of attorney documents can be drafted to apply to health care decisions as well, allowing the person you designate to make your medical decisions too. If you include health care wishes in your durable power of attorney documents, be sure to complete a HIPAA release form with it, allowing your designated person to be given access to your medical records. Alternately, a living trust can protect you in the event of your death because it allows your beneficiaries to gain control of your estate and transfer assets per your wishes, and allows the estate to avoid probate court during the process. As with your will, there should be two copies of these documents: one to be kept with your attorney and the other to be kept at home. An advanced directive may also be called a medical directive or a living will. This document allows you to dictate the medical decisions you’d like to be made on your behalf if you’re incapacitated. These documents will be used to inform your chosen medical power of attorney, or in lieu of naming a medical power of attorney. It ensures your medical wishes will be honored, whether or not the condition is life-threatening. Advanced directive laws vary from state to state, so it’s important to work with an attorney or health care professional (many hospitals provide the necessary forms) when creating the document. This is considered a less common document, but it can be beneficial if you have children — especially if you’re their primary caretaker. Some of the information included in this document may be repeated within your will, such as who you wish to have guardianship of your children should you die. However, it also allows you to name short-term guardians if you’re ever sick and unable to care for your children temporarily. Put all of these documents together in one place so you’ll have them easily accessible when you need them. Any related documentation should also be grouped in — including refinancing information, property liens and foreclosure statements (if applicable). It’s a good idea to have all of your insurance information compiled in one place, especially because you should be in the habit of reviewing your coverage every few years and updating it accordingly. 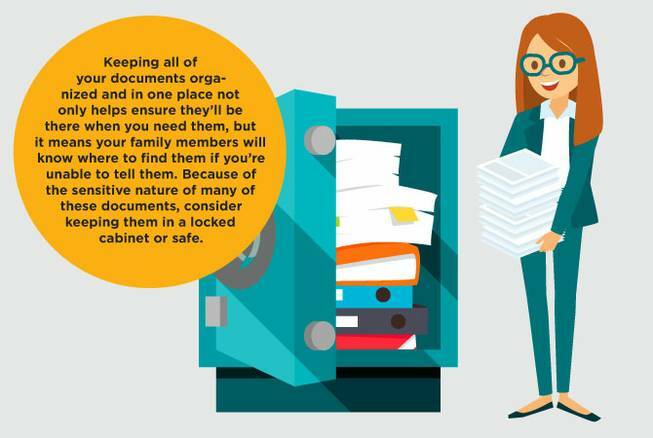 Pro tip: Keeping all of your documents organized and in one place not only helps ensure they’ll be there when you need them, but it means your family members will know where to find them if you’re unable to tell them. Because of the sensitive nature of many of these documents, consider keeping them in a locked cabinet or safe.